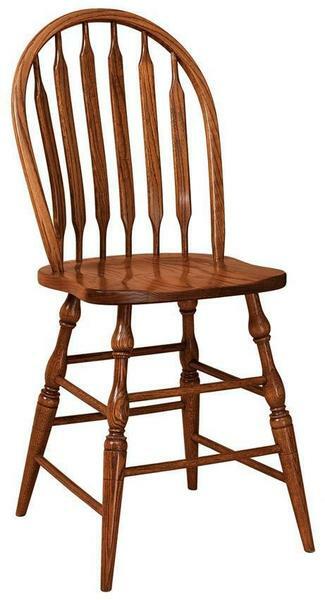 Handcrafted to perfectly match your room decor, the Amish Bent Paddle Windsor Bar Stool brings colonial style furniture to your kitchen counter, bar or island. With beautifully turned legs and bent paddle spindles to support you as you sit, this Windsor chair makes a lovely display. Made by talented Amish artists, these solid wood bar stools will last for decades, being enjoyed by your family at all events in your kitchen. No longer left in the basement, bar stool seating is a popular way to save space with higher chair styles while you get the most use out of your kitchen. Sit up at the counter to work, snack or enjoy a meal. Consider solid wood bar stools for your game room or crafting room. Complementary products include the Amish Bent Paddle Swivel Bar Stool as well as the Amish Bent Paddle Chair. Supply your pub, bar, commercial dining room or hotel with a set of these colonial style bar chairs. You can count on DutchCrafters to work hard at providing your business with the custom furniture you need. Visit our Contract Furniture Sales Page for more information about Amish made furniture for your business.